I'm sure you all know by now how much I love a good pattern test, and I've been lucky enough to be involved in a few lately. Mostly I've tested skirts, tops or cute little dresses, but when I saw a call-out for this one, I just couldn't resist applying. It's a little different to any testing I've done before, and it used some supplies and techniques I've never used before either. 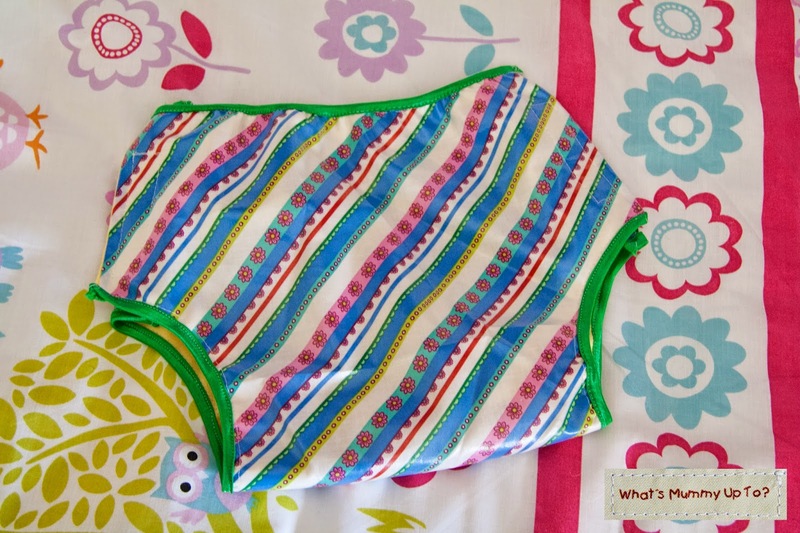 These cute little pants are the Sew Can Do Sanity Saving Training Pants ... a washable option for potty training. They're designed to be made with PUL fabric, which I had never come across before. It's sort of like a VERY thin foam, but dense enough that it would be highly waterproof. I'm not sure if that's a good description, but that's what I though of when I first touched it. There's some cute fabrics available at reasonable prices online like this one and this one. In fact there are a tonne available if you just search "PUL fabrics" on Ebay. I couldn't find any PUL fabrics in my local fabric store. The version I chose to do have handy velcro closures at the sides for easy removal after any of those inevitable accidents, and they have a soft flannel inside. They also include a place to insert an absorbent, washable pad, and therefore avoid any leaking. The waist and leg bands are made from fold-over-elastic, which is a really nice finish. I've never used that before either so I had a ball trying out some new things. Now, to be totally honest, Hannah is all done with potty training, but I loved the idea of a pattern like this as a different gift idea for friends and family with little ones, and there are always plenty of little people in my world these days. So I thought I'd give them a whirl in Hannah's size, with the plan of giving these beauties to someone who might get use from them. Oh, and keep in mind that since I made these, the pattern has been re-worked slightly, including a reduction in the width of the crotch area, which I did find a little "bunchy" on Hannah, so Cheryl has done the right thing there. Also, when I was scrambling to find my supplies in time, I couldn't get wide enough fold-over elastic, and ended up opting for a narrower 1-inch. DON'T DO IT! ... keep hunting and find the correct width. I had a terrible time trying to get my elastic to work, and it was totally my fault for not have the correct elastic. Next time I will hunt a bit further to find the wider option. Anyway, all in all this was a fun pattern test, with a cute result, and if you're wanting washable potty training pants, then I'd definitely give these a go. You can find Cheryl's pattern for sale here!